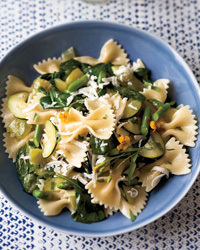 The night before a long bike ride, Laurent Gras carbo-loads by eating pasta tossed with a variety of vegetables for dinner; here, he combines green tomatoes, zucchini, asparagus and vitamin Arich spinach. 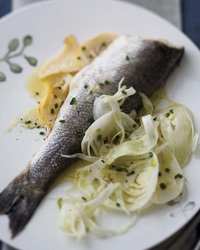 Laurent Gras uses ginger, fennel and lemon to flavor his lean, protein-rich striped bass as it steams; then he serves it over a lemony shaved-fennel salad, an excellent source of vitamin C. "Instead of using oil or butter, I like to steam fish with aromatic ingredients," Gras says. 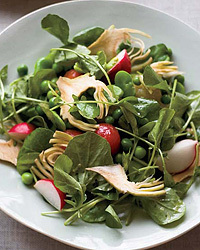 "You get as much flavor this wayusually more."